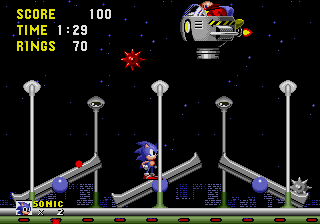 For the Star Light Zone Boss, Robotnik flies back and forth across the screen, over three see-saws. Just out of reach of Sonic's jump attack, he periodically drops spiked bombs onto the see-saws in a basic sequence. These bombs have a short fuse, but before detonating they can be flung back up to hit Robotnik's ship as he flies over, if timed correctly, by having Sonic jump on the opposite end of the see-saw. Alternatively, the bombs can be used as a counter-weight to propel Sonic skyward, by waiting on one side of the see-saw for Robotnik to drop a bomb on the other side. This can be difficult if you do this recklessly, but if taking your time you may be struck by a bomb from above. You need to be quick, and careful while battling this boss. After eight hits using either method, Robotnik is defeated. It is possible to hit this boss by just jumping normally, by jumping from the center of a platform as Robotnik is flying towards you, but it is very hard, as it requires precision timing.